Since purchasing my Prius in December of 2006, I’ve had 3 sets of tires. The stock Bridgestone Turanza EL400’s, the Bridgestone Potenza G019 Grid’s, and now the Bridgestone Ecopia EP422’s. Yes, it seems I have a thing for Bridgestone, but really, it’s just because there’s a Bridgestone/Firestone here in town that originally did an online pricematch for the Potenza’s, and then when they failed early (cupping), they gave me a large discount on the Ecopia’s. Since I’ve had the Ecopia’s for over 10k miles now, I thought I’d circle back around, and do an analysis of my mileage with each, and see if there is really any solid comparison. Subjectively, before running any numbers, I feel like the Turanza’s gave better mileage than the Potenza’s, and the Ecopia’s have given me better mileage than both. Without further ado, here’s the data. This is going to be a rather long post, so first, some backstory: We picked up our ’07 Prius Touring in December of 2006. 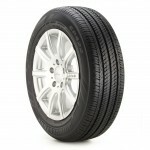 It came stock with 16″ (P195/55R16) Bridgestone Turanza EL400 tires. As usual, stock OEM tires are generally low wearing (they’re cheaper, and they tend to be quieter). They lasted us about 26k miles. At that point (Sept 2008), we purchased Bridgestone Potenza G019 Grid’s, which was one of the few options available for the car at the time. There were no real low rolling resistance (LRR from here-on) available at that time. These were decent tires, for a while. We lost some MPGs with them, but that’s normal for new tires (new tires have higher rolling resistance than worn ones). What we didn’t expect was that they became exceedingly noisy (by the time we put 40k miles on them, they sounded like mudding tires on a truck). Turns out, they were cupping quite badly on the inside edge. Speaking with the local Firestone manager, he said it was pretty common with those tires, partly because they’re unidirectional (when you rotate them, you basically have to keep them on the same side of the car). But that should only explain one side cupping… all four were cupped significantly. Reading online, this seems to be a common complaint, so I’d imagine it’s something with the design. Anyway, we just bought some real LRR tires to replace the Potenza’s (as the shop said they were getting near the end of their life, and the cupping noise was beyond bearable): Bridgestone Ecopia EP422’s (review of them in the coming months). And man oh man, are they sweet. The car feels like it’s floating, and it’s as silent as can be. Anyway, now that I’m done with the Potenzas, I figured I’d do some comparisons on mileage, and in a way, how rolling resistance really can matter.